We are excited to announce that Trak.in is now natively available on Android and iOS devices. 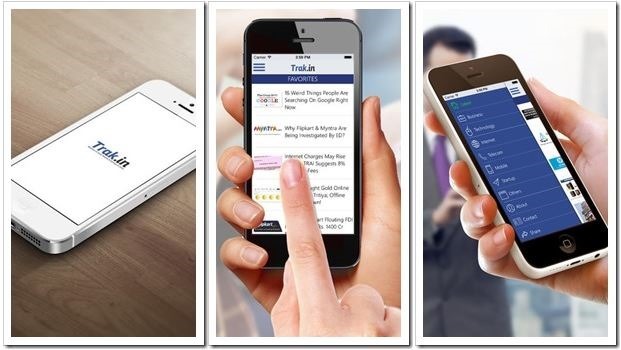 Over last couple of years, Trak.in has seen tremendous increase in traffic from mobile devices. In 2011, Trak.in used to get about 5 to 8 percent traffic from mobiles and tablets, however, that number has shot up to over 40 percent now. So 4 out of 10 people now access Trak.in on their mobile phones. While Trak.in is very much a responsive site (means it adjusts the structure as per the device size and resolution), but still it does not offer a great experience to our readers and hence we decided to go ahead and built a separate native app for mobile devices. Both, iOS and Android version of apps are now live for download. The app offers all the articles published on Trak.in in real time. As soon as the posts are published on trak.in, they show up on the app. The Trak.in app works quite smoothly even on under powered devices and gives you distraction-free reading experience. The app offers standard social media sharing and also includes favourites feature (similar to a bookmark) which essentially allows you save a particular post for later reference. The Trak.in mobile apps have been developed in partnership with Winjit Technologies. If you face any issues or come across any bugs, please do not hesitate to contact us on support-at-trak.in. Note: The app is offered free of cost, and is ad supported (hope our readers don’t mind it). Amazing!!!!! Congratulations on this achievement!! !